Nowadays, most musicians are content to release an album every year or two. It’s a far cry from the sixties and seventies when bands would regularly release two albums a year. That most people thought, was a thing of the past. However, it’s not. Dave Schmidt is proof of this. His three groups have released fifty-eight albums since 1998. That’s when the Dave Schmidt story began. Back then, Dave Schmidt was a member of Zone Six. He was the bassist and keyboardist for the German psychedelic space rockers. They were about to release their eponymous debut album in 1998. Zone Six launched the band’s career, and later in 1998 they returned with Live Pebbles Volumes One. This was a taste of what was to come from Dave Schmidt. By 20002, Zone Six had released another trio of live albums. Live Pebbles Volume Two and Triprock Live ’99 were released in 1999. Three years later, and Live At RAW Tempel was released in 2002. However, by then, Dave Schmidt had launched Sula Bassana his latest musical project. Sula Bassana was essentially, a musical vehicle for the multi-talented Dave Schmidt. This made sense. A new musical vehicle would allow Dave Schmidt to experiment musically. However, his name didn’t feature on Sula Bassana’s 2002 debut album, Dreamer. Instead, Sula Bassana was credited as performer, producer and recordist. It seemed that musically, Dave Schmidt had been reborn, and was going to divide his time between Sula Bassana and Zone Six. That was the case for the next few years. By 2006, Sula Bassana and Zone Six were both prolific bands. Zone Six released nine albums, including three studio albums and six live albums. Meanwhile, Sula Bassana had released seven albums. This included four studio albums and three collaborations. Two of Sula Bassana’s studio albums had been released on a new label, Sulatron-Records. Not content with being a member of two of the most prolific European bands, Dave Scmidt had decided to launch his own label in 2006, Sulatron-Records. This made sense. Sula Bassana had released four albums during 2006. If the albums were released on another label, they were profiting from Sula Bassana’s success. So Dave Schmidt made the decision to found Sulatron-Records. The new label’s first release was Sula Bassana’s Endless Winter. Not long after this, Sulatron-Records released Sula Bassana and Friends’ double album Spaced Out. Having released its first two releases, Sulatron-Records began to expand its roster. One of the first bands to release an album on Sulatron-Records were Zone Six. They released two albums on Dave Schmidt’s new label during 2007. The first was Live At Burg Herzberg Open-Air 22.07 2006. It was the nascent label’s fourth release. Later in 2007, Zone One released 10 Years Of Aural Psychedelic Journeys, Rare and Unreleased. Zone Six would return to Sulatron-Records over the next few years. By late 209, Dave Schmidt had joined a new band, Electric Moon. He was a still running Sulatron-Records and a member of Zone Six and Sula Bassana. Both were just as prolific. As 2009 drew to a close, Zone Six had released fourteen albums. Eleven were live albums and three were studio albums. Dave Schmidt was still busy will Sula Bassana. Just like Zone six, Sula Bassana hadreleased fourteen albums. Seven of these albums were collaborations. On Sula Bassana’s studio albums, Sula Bassana enjoyed the opportunity to experiment and journey in different directions from Zone Six. Dave Schmidt it seemed, had the best of both worlds. Now he was about to embark upon a new musical adventure with Electric Moon. Having formed Electric Moon in late 2009, the psychedelic-space rockers began working on their debut album. Lunatics was released in 2010. Then later in 2010, Electric Moon released Live At Epplehaus 2010 on Sulaetron-Records. This was the start of a truly prolific period for Electric Moon. When Electric Moon released Theory Of Mind in 2015, it was the band’s nineteenth album. This included studio albums, live albums and collaborations. Most of Electric Moon’s albums had been released on Sulaetron-Records. They were one of the label’s success stories. So were Zone Six. By 2015, Zone Six had released nineteen albums since their debut album in 1998. Zone Six’s most recent album Love Monster, was one of five albums they had released on Dave Schmidt’s Sulaetron-Records. Love Monster also one of Zone’s Six’s most successful album. It was their first studio album since 2003, and one of the best albums Zone Six had ever released. Could the same be said of Sula Bassana? Recently, Sula Bassana released their latest studio album, Shipwrecked on Sulaetron-Records. 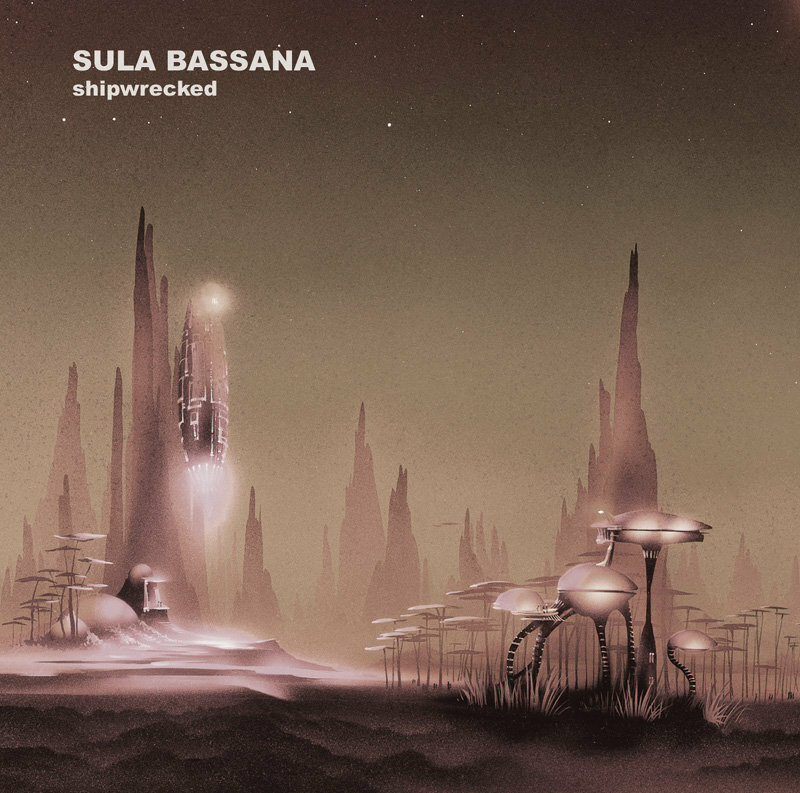 Shipwrecked was Sula Bassana’s twentieth album, and first studio album since Dark Days in 2012. For Shipwrecked, Dave Schmidt has locked himself in the studio and has written, recorded, mixed and produced six new tracks. These tracks are described as electronic Krautrock. That’s despite mostly vintage instruments being used on Shipwrecked. Before recording of Shipwrecked got underway Dave Schmidt gathered together the array of instruments he’s collected over the years. They were a mixture of traditional and electronic instruments. Synths, a sequencer, organs and drum machines sit side-by-side with a melotron, bass and guitar. There’s even a toy-Mandoline on Shipwrecked, the twentieth album of Sula Bassana’s career. Moonbase Alpha Alpha opens Shipwrecked. A myriad of futuristic, sci-fi sounds are joined by what sounds like snippets of dialogue from an Apollo space mission. The words “the eagle has landed” signals the arrangement to unfold. Drums courtesy of a vintage drum machine crack; while synths pulsate. Panning is used extensively, shifting the the arrangement from side to side. This adds an element of drama to this pulsating slice of electronic Krautrock. Meanwhile, understated, deliberate keyboards sit low in the mix. They’re surrounded by layers on instruments, as the drums crack and the arrangement builds. By then, Dave Schmidt seems to be paying homage to Cluster, Kraftwerk, Michael Hoenig and even Rodion G.A.’s Misiunea Spațială Delta on Moonbase Alpha Alpha. By them a dramatic and cinematic soundscape that would be the perfect soundtrack to a new sci-fi short has evolved. Understated and mesmeric, straight away, there’s an Eastern influence as the arrangement to Shushie Express unfolds. That’s down to the hypnotic, vocoded drone. It sits centre-stage, alongside the drums. They epitomise Krautrock, with the Apache or Dinger beat. Meanwhile, while wistful, almost eerie synth strings play slowly. They’re the polar opposite of the drums and drone. Synths fatten the sound, as the arrangement skips along. Futuristic, sci-fi sounds add to the hypnotic, almost robotic nature of the track. Elements of Berlin School, Krautrock, avant-garde, electronica and world music combine seamlessly. The result is a hypnotic, melancholy and melodic fourteen minute epic, which references Can, Cluster, Kraftwerk and Neu! A slow, deliberate and buzzing synth sets the scene on No Time: No Eternity. As the synth meanders deliberately along, drums crack and resonate. By then, the darkness has descended. Moody and broody describes the arrangement. So does mesmeric, lysergic and cinematic. Still, the arrangement continues to plod along at funeral pace. Despite the tempo, drama is omnipresent. That’s the case as slowly, and gradually, the arrangement changes. Instruments are added, including the buzzing synth and synths strings. They add a wistful sound to the dramatic, pensive and moody soundscape. The introduction to Planeta Bur has an eighties sound, as drums and a bass synth combine in the introuduction. Soon, Dave Schmidt is deploying his array of instruments. Traditional instruments and synths are used to sculpt the soundscape. However, nothing is as it seems. Dave Schmidt deploys a myriad of effects. They transform the original signal, transforming it into something entirely different. Synths play an important part as a droning, churning multi-layered arrangement unfolds. Sometimes, there’s a robotic sound to parts of the arrangement. Other times there’s a nod to experimental music, Berlin School, eighties electronica and avant-garde. Washes of synths and drums combine with synth strings. By the words hypnotic and later dramatic spring to mind, as Sula Bassana continues to captivate in this latest musical adventure. Just a mellotron plays slowly and thoughtfully on Shipwrecked. Space is left in the arrangement. Even when synths are added. This allows the listener to provide pictures to Sula Bassana’s melancholy, heart-wrenching soundtrack. This is down to the addition of synth strings which are the perfect counterpoint to the maudlin mellotron. Together, they create a quite beautiful, cinematic and sometimes, dramatic track. No Way closes Shipwrecked. A guitar plays, feeding back. However, Dave Schmidt manages to tame the tiger. By then, instruments and effects are added. Synths and an organ combine with the guitar. As it feedbacks, synths bubbles and an organ plays. Its reference point is progressive rock. When this is combined, the result is another sci-fi inspired soundscape. This bookends Shipwrecked perfectly. Shipwrecked is the fifty-eighth album that Dave Schmidt has released since 1998. That was when his career began with Zone Six. By 2002, Dave Schmidt was recording as Sula Bassana. It was the musical vehicle for his solo projects. However, Sula Bassana had to fit around Zone Six. So sometimes, Dave Schmidt had to put Sula Bassana. Indeed, for three years between 2003 and 2006, Sula Bassana never released an album. Then they released a quartet of albums in 2006. Two of these albums were released on Sulatron-Records, the label Dave Schmidt founded in 2006. It would become home for Sula Bassana and sometimes, Zone Six and Electric Moon. Formed in late 2009, Electric Moon was the third band that Dave Schmidt would join. It was by far, the most prolific of the triumvirate of bands. They’ve released nineteen albums between 2010 and 2015. However, Sula Bassana have gone one better. Recently, Sula Bassana released their twentieth album since 2002, Shipwrecked. It was released on Dave Schmidt’s Sulatron-Records. Shipwrecked is best described as an album of electronic Krautrock, albeit with a few detours. On Shipwrecked, Dave Schmidt combines elements of avant-garde, Berlin School, experimental and psychedelia with electronic Krautrock. In doing so, Sula Bassana draws inspiration from, and pay homage to Can, Cluster, Kraftwerk, Michael Hoenig, Neu! and Rodion G.A. When this heady brew of musical genres and influences is combined, the result is Sula Bassana’s twentieth album, Shipwrecked. It features music that veers between dramatic to broody and moody, to hypnotic and mesmeric right through to melancholy and wistful. Other times, the music on Shipwrecked ranges from lysergic to futuristic and even beautiful. Always though, Sula Bassana’s music on Shipwrecked is innovative, captivating and cinematic. Shipwrecked sounds like the soundtrack to a film that’s yet to made, but if it ever is, is sure to be a blockbuster.